The possibility is strong when it comes to a match-up between arguably the top two pound-for-pound fighters in MMA: UFC welterweight winner Georges St. Pierre and UFC middleweight champ Anderson Silva. But UFC president Dana White said the road to that possibility is long, and perhaps bloody. 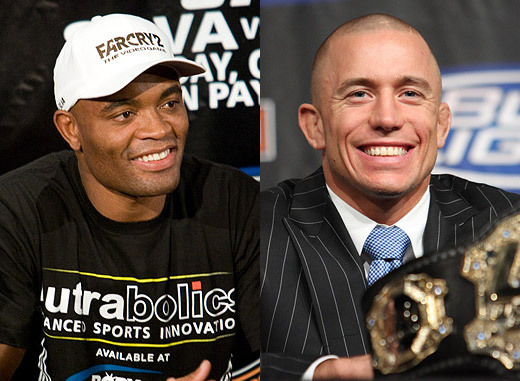 A lot have been clamoring for the GSP-Silva showdown, and White hinted relenting on staging the show in the past. But his present views consisted of waiting for the right timing and knowing it is making perfect sense. “I’m not crazy about the fight because Georges St-Pierre is a real 170-pounder. Anderson Silva is a freak who, he makes 85, but this guy could compete and I think do well at 205, so it’s just a tough fight for me. UFC has been about pitching in the best match-ups, and the GSP-Silva fight could be the greatest of them so far. For now, according to White, the two just have to keep knocking guys off–and if the clamor stays and heightens up, then maybe we will see GSP and Silva stand in the same cage together.